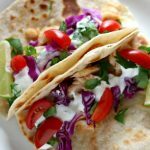 Alaska Cod Fish Tacos with Garlic Lime Sour Cream (slow cooker, instant pot or oven)–well seasoned flaky white fish is served wrapped up in a freshly cooked tortilla and topped with purple cabbage, tomatoes and the best sour cream of your life. 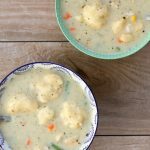 A fresh, healthy and easy family friendly recipe that is perfect for any day of the week! 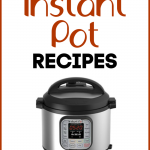 Plus you can choose how you want to prepare it–oven, slow cooker or instant pot! I’m so excited to share with you today this amazing fish taco recipe! My kids, husband and I seriously couldn’t get enough of these tacos and the sour cream was seriously the best sour cream I’ve ever eaten. Secretly I was eating it off the spoon. 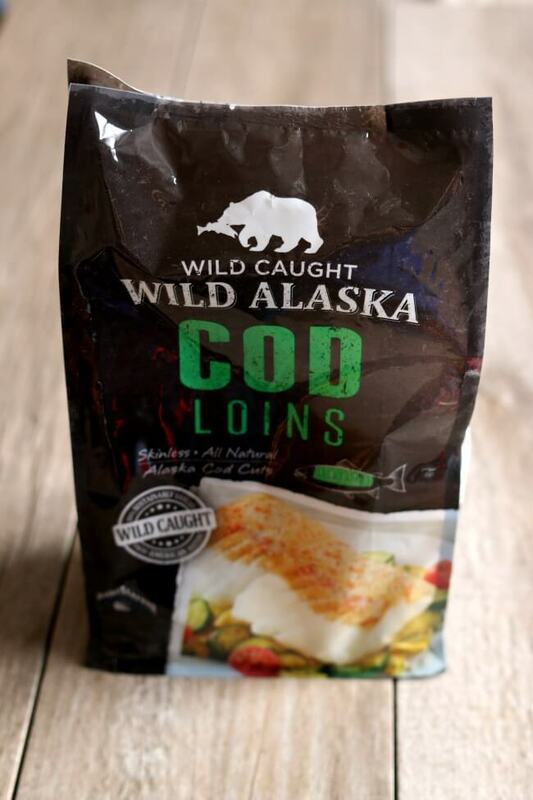 To make these fish tacos I decided to go with Alaska cod loins. I chose a frozen package since that’s what was convenient at the time. It was surprisingly pretty affordable! This package fed the four of us and wasn’t much more than $4. I always thought that fish was too expensive to eat often but I was wrong. If you think that your kids don’t like fish let me tell you a little secret. Just make a taco for them with all the fixings and let them try it. They won’t know the difference. “Mom, this chicken is yummy!” LOL! My kids are so used to seeing different things on their plates that they don’t fuss much but I know all kids aren’t the same way. Just make the kinds of foods they like but swap out the ground beef or chicken with fresh Alaska fish instead. For example instead of chicken nuggets, give them fish sticks. There are so many amazing varieties of wild-caught Alaska whitefish such as halibut, sablefish (black cod), sole, Alaska pollock and cod. With so many delicious choices it can be easy for the whole family to eat more seafood. It’s crazy to think that Alaska’s wild fisheries contribute nearly 60% of all seafood harvested in the United States. When you go to purchase your seafood make sure to “ask for Alaska!” That way you’ll know you’re getting the purest, highest-quality seafood. To make these Alaska Cod Fish Tacos I started with a large piece of foil (if you’d rather use parchment paper you can use that instead). 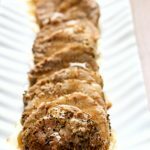 I laid my filets on top of the foil, drizzled them with oil and seasoned them. I used frozen fish fillets (I did not thaw them). Then I gathered the edges of the foil and made a loose foil packet. There was still room for the fish to steam inside the packet. This is very important. Don’t press the foil down tightly on the fish, leave a pocket of air for them to breath. At this point you can choose your method of cooking the fish. 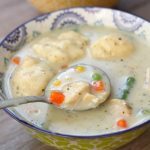 You can cook it on a trivet in the instant pot, on a pan in the oven or in the slow cooker. After the fish is cooked put it in a bowl with the juices inside the foil packet and use a fork to flake it into pieces. While the fish was cooking I prepared my toppings. 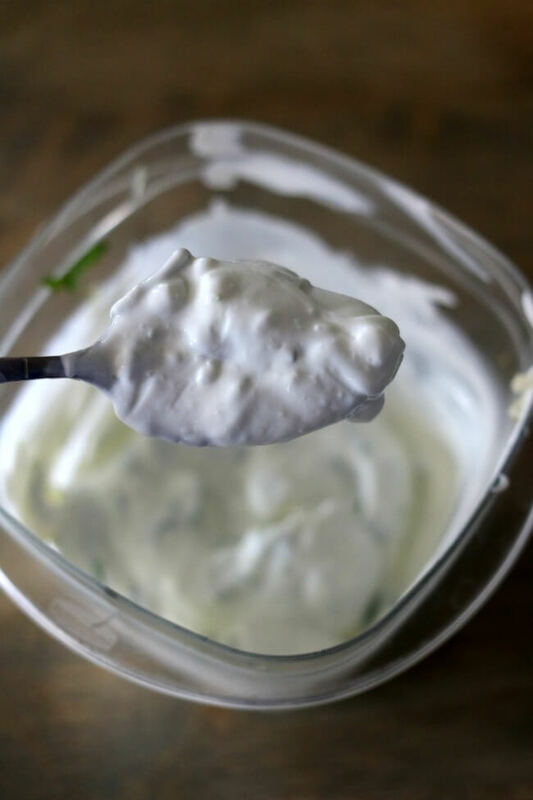 Making the garlic lime sour cream was so easy and I’m telling you it is going to blow your mind! You’ll need a fresh lime and some of the zest from the lime, plus a clove of fresh garlic and some cilantro. Stir it all together and try a taste. YUM! I also chose to use uncooked (fajita-size) flour tortillas. All you have to do is heat up a skillet or a griddle and cook for about 30 seconds on each side. They bring a whole new meaning to taco night! Another integral part of fish tacos is the cabbage. 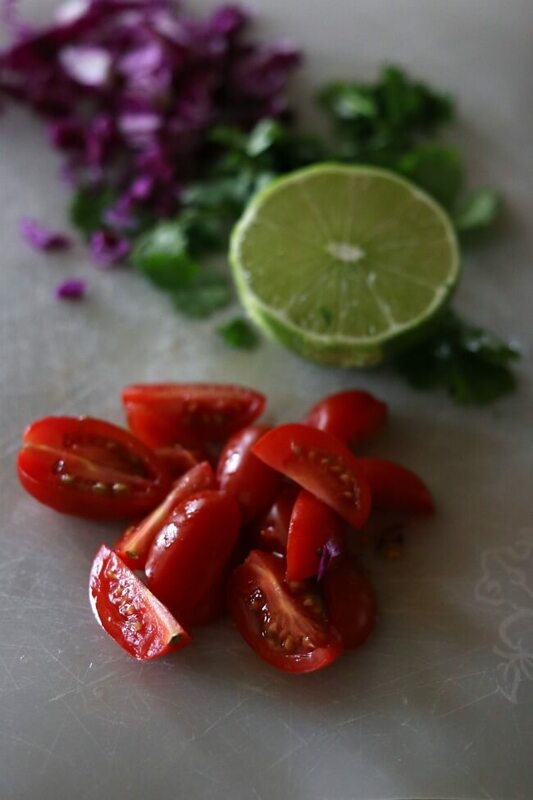 I chose a purple cabbage and cut it up along with some grape tomatoes and cilantro. I also squeezed some fresh lime juice on each taco. The results were an amazing burst of flavor that had all of us wanting more! 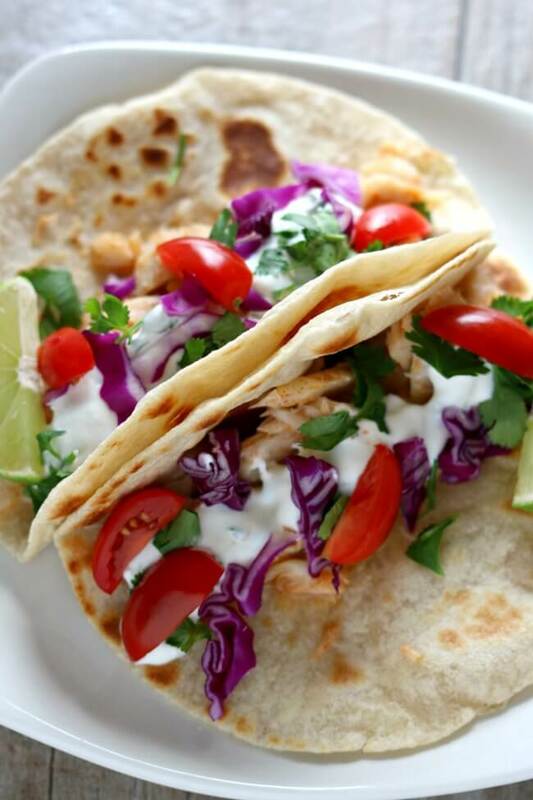 Add these Alaska cod fish tacos to your menu this week! I hope this recipe for Alaska Cod Fish Tacos has inspired you to #AskForAlaska at the seafood counter and in restaurants! You can choose so many varieties that are sold year round, fresh or frozen. Visit www.wildalaskaseafood.com for hundreds of Alaska seafood recipes! 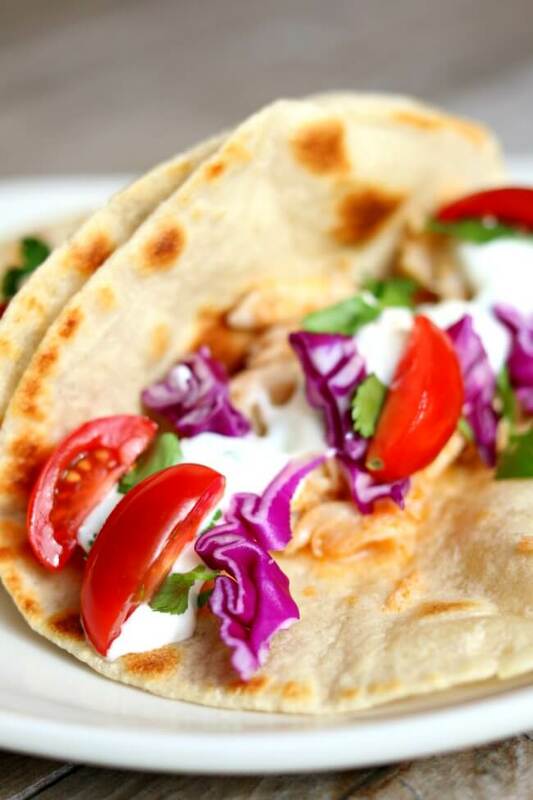 Well seasoned flaky white fish is served wrapped up in a freshly cooked tortilla and topped with purple cabbage, tomatoes and the best sour cream of your life. 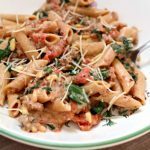 A fresh, healthy and easy family friendly recipe that is perfect for any day of the week! 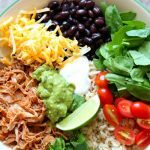 Plus you can choose how you want to prepare it–oven, slow cooker or instant pot! Rip off a large piece of foil (you can also use parchment paper), about 24 inches. Place the fish fillets in the middle of the foil. Drizzle the oil and lime juice evenly over the fish. 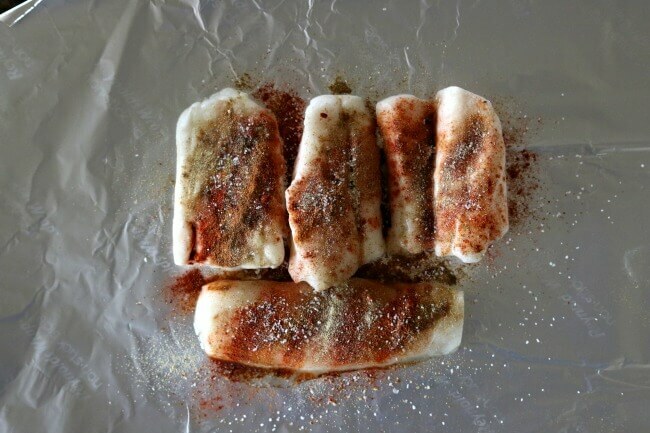 Sprinkle the fish with cumin, coriander, smoked paprika, ground red pepper and kosher salt. Bring up sides of foil; fold down two times. DOUBLE FOLD both ends of foil to seal packet, leaving room for heat circulation inside. To cook in the oven: place foil packet on a baking sheet. 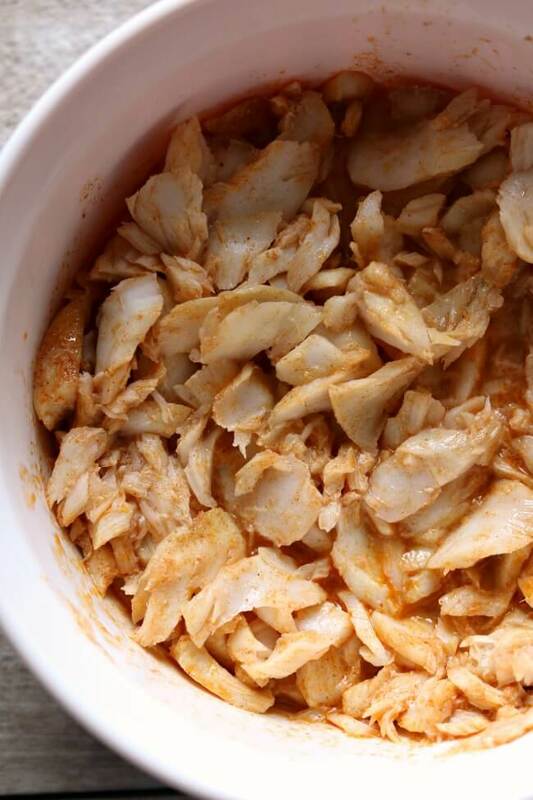 Bring oven to 425° F. Bake in the oven for 20 minutes, until fish flakes easily when tested with a fork. To cook in instant pot: Pour 1 cup of water in the bottom of pot, place trivet in bottom of the pot. Place foil packet on top of the trivet. Cover and secure the lid, valve should be on sealing. Manual/pressure cook button for 8 minutes. Fish should flake easily when tested with a fork. To cook in slow cooker: place foil packet in slow cooker and cook on high for about 2 hours, until fish flakes easily with a fork. (Note: all slow cookers cook differently, if your slow cooker cooks “hot” you may want to check the fish at an hour and then again at 90 minutes). When fish is done cooking carefully open the foil packets. They will be super hot and have juices in them so be careful. Place fish and juices in a bowl and break the fish into pieces with a fork. Add extra seasonings to taste. In a bowl prepare the sour cream by stirring together the sour cream, cilantro, lime zest, lime juice, salt and garlic. Refrigerate until ready to use. Prepare your other toppings of choice. Right before you want to serve cook your tortillas on a medium high heat skillet or griddle until bubbling (30-60 seconds on each side). 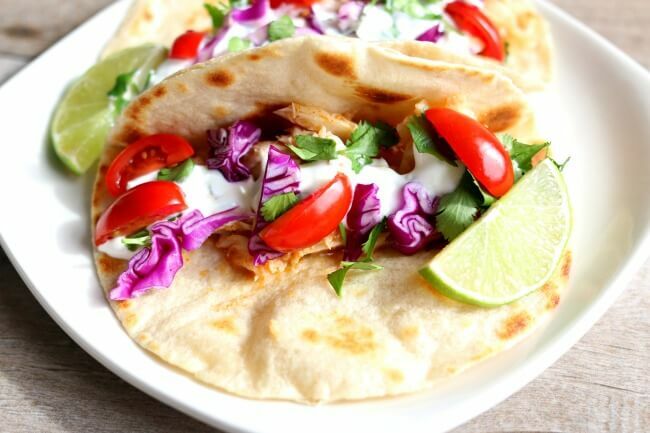 Assemble your tacos: cooked tortilla, fish, sour cream, cabbage and tomatoes. Eat and enjoy! I would like to have this on a bed of Quinoa or rice instead. Can I make either with the fish on top, without the foil packet? There was a chicken recipe you had where you made the Rice with the chicken. I would do quinoa. Rice would take too long and the fish would get overdone. So I’d do a 1:1.5 ratio of quinoa to water. Make sure to rinse the quinoa first. Pour that in the bottom of the Instant Pot. Then forgo the foil packets and place fish fillets on top. Set the timer for 1 minute and let it sit afterwards for 10 minutes at least (up to a full natural pressure release). check fish for doneness with a thermometer. The middle should read 145 degrees F. Good luck! Do you use Quick release or Normal release, at the end of pressure cooking? I used a quick release. Thanks for asking! I need to clarify that. Didn’t have the ingredients to make your recipe & I wanted to cook a filet of Tilapia. Couldn’t find any other recipe for fish. Figured a frozen seasoned filet of Tilapia would cook the same as in your recipe. Followed instructions exactly, made foil packet, Pressure cook on High for 8 min., quick release. My fish filet was thawed and cold. I had seasoned it with Old Bay seasoning, drizzled with olive oil, and slice of lemon on top in foil packet. What could have happened? FYI…Put fish back in my Instant Pot, repeating the exact same steps as above for an additional 8 min., 5 min. Natural release, Tilapia came out beautifully, perfectly flaky, not over done and was delishes. Still wondering why it didn’t cook in the first 8 min.? Wow sill frozen? Weird! I’m not sure why and what the difference was. Can You use Tilapia instead of Cod? YES! That would work well. I am interested in buying a instant pot. Besides making soups, stews, chilli…I would like to cook roast and smaller chickens in the instant pot. My family size is 3 and we use left overs for the next day for lunches. What size of pot would you recommend? I would buy a 6 quart. You can cook most everything you want in there. Made fish tacos for lunch today. My daughter was skeptical as she doesn’t like fish. These were fabulous! She loved them, too. The sauce is out of this world. Thank for you another delicious recipe. Hi, is fish cooked from frozen or thawed?